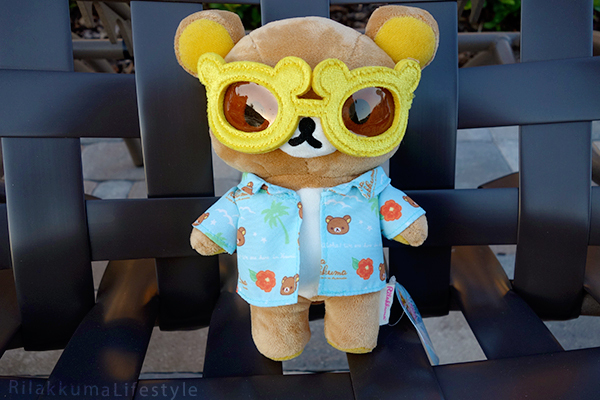 Aloha Rilakkuma Plushie – Rilakkuma Store Exclusive! + Simon wins the Mira Plush Art Contest! Super exciting news!! Check out our cute new Rilakkuma Store Exclusive Aloha Rilakkuma plushie! I’d like a pair of shades like that! And his name is embroidered on the back of his shirt! 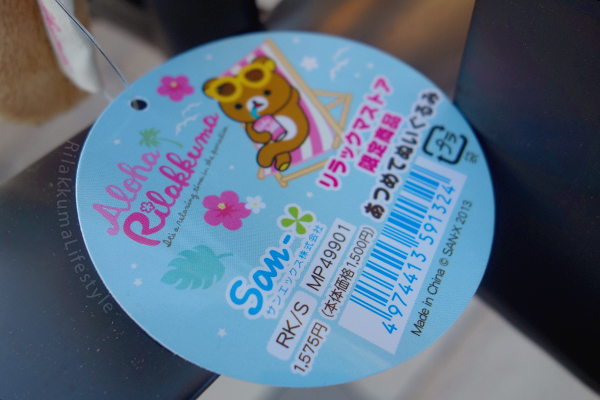 Relaxed Rilakkuma on the tag art! 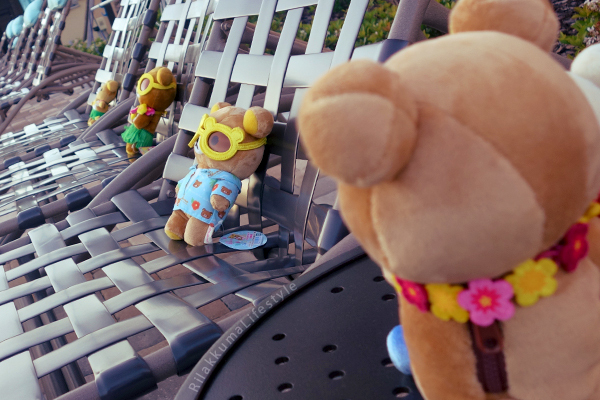 The newest member of the Aloha Rilakkuma family relaxing in the sun with his pals! 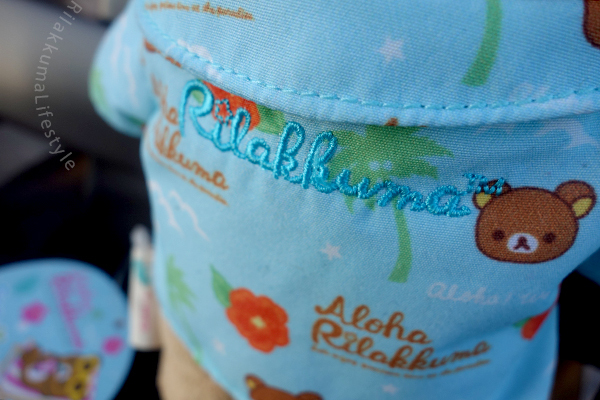 I love how our Aloha Rilakkuma family has been expanding recently! This sunshine-ready bear is the Rilakkuma Store exclusive plushie from the Aloha Rilakkuma series, released in April 2013! He is particularly special to us because Simon won him in the Spring 2014 Mira Plush Art Contest! Rilakkuma Crossing The Ocean is inspired by Washington Crossing the Delaware, an 1851 oil-on-canvas painting by the German-American artist Emanuel Gottlieb Leutze, painted to commemorate General George Washington’s crossing of the Delaware River on the night of December 25–26, 1776, during the American Revolutionary War. 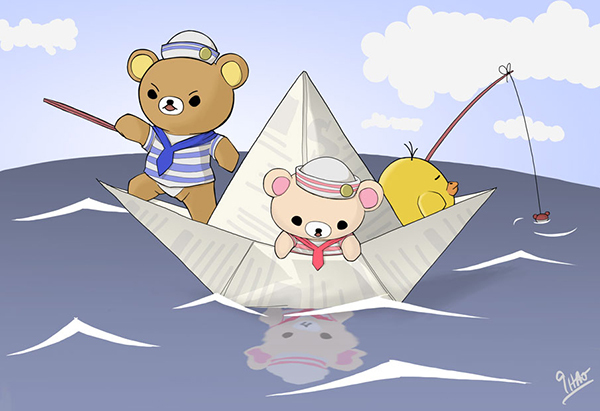 While Marine Rilakkuma is likely too lazy to be a general in the military like Washington, Rilakkuma Crossing The Ocean represents thoughtful reflection and serenity as Rilakkuma and pals drift across the ocean in their newspaper boat on a lazy afternoon. Thanks so much for sponsoring this contest and so generously supporting the Rilakkuma art community, Mira Plush! Make sure you check out Mira Plush’s online Rilakkuma store – I’ve purchased from them before, and they’re very fast and reliable! Mira Plush also has a great new WordPress blog full of fun photos, so be sure to support them there, too! It’s really so fun to share Rilakkuma art with the community! CONGRATULATIONS, Simon! 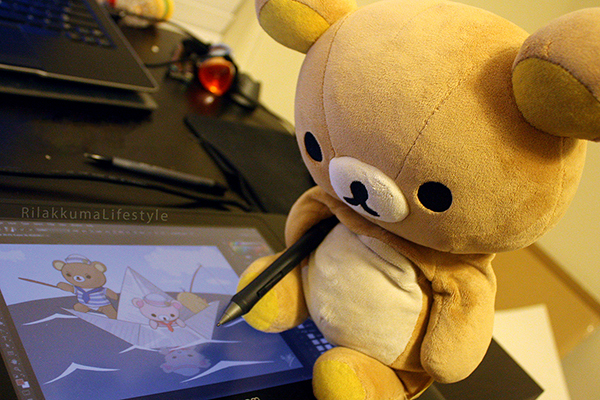 Hey, even Rilakkuma likes to draw, too! For Simon’s next work, he’s considering doing an interpretation on the new Rilakkuma in Space Series to be released in July. We’re constantly thinking of new Rilakkuma scenes and inspiration for Simon to draw – ideas are welcome! I love that picture with all the Aloha Rilas just chilling. I wish I could join them, I could definitely do with some R&R. Congrats to Simon! The portrait looks amazing, I think he did an amazing job drawing all of them, their actions really represent who they are in my opinion. Can’t wait to see his Space Series portrait, I’m sure it’ll be just as awesome as all his other ones! I love the sunglasses too! Always amazed to see the detail they put in the Rilakkuma accessories. I’ve been visiting your blog for a little but now, as I myself have gotten into Rilakkuma. Thanks to you I’ve found stores that sell genuine ones. I already have a classic plushie, and the “which color do you like” one. I’m waiting for the Polar Bear series to come in the mail! I love your blog and your lifestyle photos are adorable. Happy blogging, and here’s to hoping I someday get a collection like yours! Hey, thanks so much for reading my blog!! It’s so great to hear that you’re starting your own Rilakkuma collection too :D You’re definitely off to a good start! Ooooo I really really need the Aloha series in my life, it feels like a vacation with them around, your so lucky that you have the complete series, I hope I can get my hands on at least one of them! His sunglasses are so adorable, and makes him look handsome! Congratulations Simon, your photo is so amazing and funny! I can’t wait for your Rilakkuma In Space drawing! Maybe Rilakkuma will come up with an awesome drawing too, good luck! Eee I love this series so much, too – makes me want to take a vacation haha. 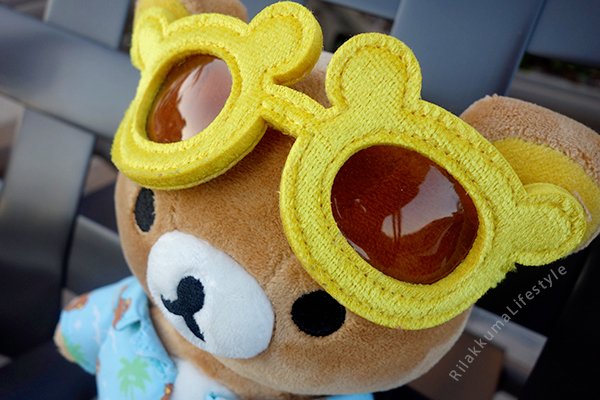 His bear sunglasses are really my favorite accessory, and the design on his shirt is really detailed! I’m so happy to expand my Aloha Rilakkuma collection with this bear – I think it’s the series I have the most plushies from now!